WHO AM I? SAGGITTARIUS or OPHIUCHUS? Should I have an identity crisis? Through the years I’ve existed on the Zodiac list as a Sagittarius, being born between November 23 and December 21. Seeking knowledge and wisdom, never tiring of the quest for what is yet to come. An outgoing and joyful mood, which can become more sullen if the Sagittarian feels their wings have been clipped. Well, that pretty much describes me! Or does it? The news this week is that I fall under a different sign. Parke Kunkle, a Minnesota Planetarium Society board member, claims that the earth has tilted and realigned itself, relocating the sun into “a different constellation than it was 3,000 years ago” when astrology began and the twelve astrological signs were designated. Thus, many persons now fall under a different sign than they thought they did. I’m one of those. Not only do I fall under a different sign, I fall under a new sign: Ophiuchus! But perhaps the change won’t be too traumatic, since there is a claim that the Ophiuchus personality is a blend of Scorpio and Sagittarius traits. 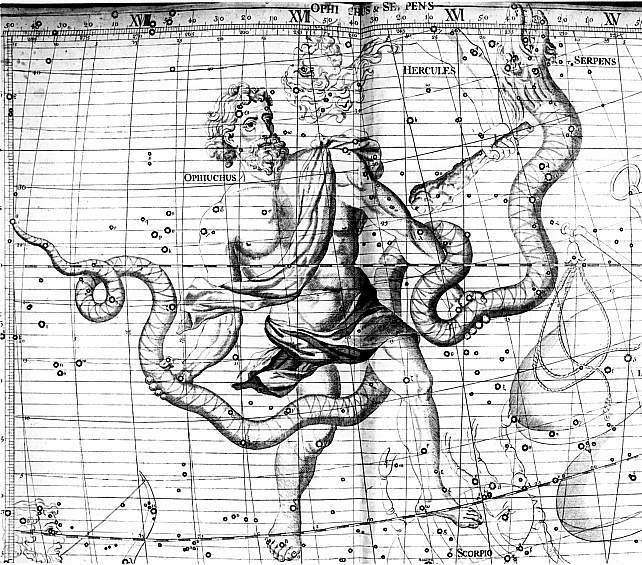 The name Ophiuchus (pronounced off-ee-YOO-cuss) is derived from the Greek word for “serpent handler.” It is the only astrological sign based on a real person. He is represented by a man with a snake coiled around his waist—he holds the head of the snake in his left hand and its tail in his right hand. 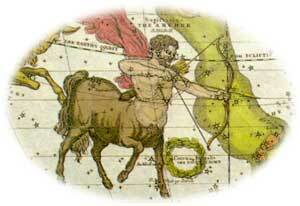 Ophiuchus was actually raised by the kind centaur Chiron who taught medical skills to the boy. Over time, Ophiuchus became an incredible healer. Indeed, he could even bring the dead back, and Hades, who ruled the underworld, complained to Zeus that his realm was threatened. Finally, Zeus struck Ophiuchus down with a thunderbolt, but placed him in the sky so that he might be remembered. The rod with a snake winding around it is a widely-recognized symbol for medicine. A special love for arts and language and a high passion about pursuing the same. Less patience, and do not like to indulge in meaningless or senseless banter. Very intuitive and have a lot of foresight. Look to heal and attain a higher position in life. Bored of monotony and seek change in their routine. Knowledge and wisdom seekers throughout their lives. Having a flamboyant dressing sense, they are seen to prefer bright colors. They progress well throughout their lives. Steadily and surely. 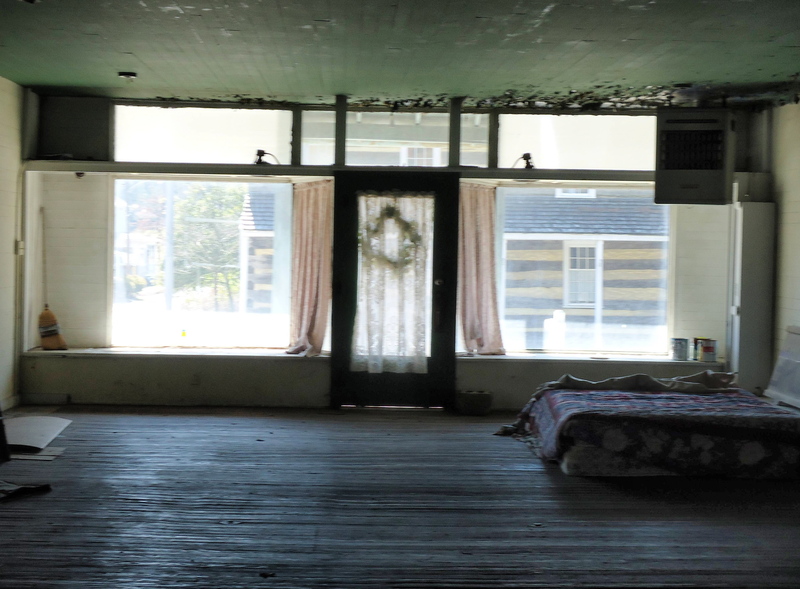 A love for their space and freedom to explore new avenues and satisfy their curiosity. A sarcastic sense of humor resulting in their making very few friends who can understand this streak in them and can take it in their own stride. I think I will have to study these lists to see the minute differences. That fits in with the Sagittarian trait of seeking knowledge and wisdom, never tiring of the quest for what is yet to come, and the Ophiuchus trait of A special love for arts and language and a high passion about pursuing the same. Perhaps I won’t have an identity crisis after all. But the first thing I will have to do is learn to spell Ophiuchus. It’s January: Am I Stressed Out? I want to see you wear more plaids, Carolyn. Live up to your Zodiac sign traits! !